The Digitsole SmartShoe has reached its Kickstarter funding goal with almost four weeks remaining in the campaign. Those were three small words for Marty McFly, but for humanity, it was the starter pistol that signaled the beginning of a technological arms race towards fancier footwear. Nike eventually realized humanity’s dream of self-lacing shoes, but there’s still room for greater advancement. The Digitsole SmartShoe is evidence of that; these smart shoes can do everything from activity tracking to giving personalized feedback on your gait. The team behind it has taken to Kickstarter to fund a preliminary production run, and the campaign has already reached its goal amount with almost four weeks to go. First things first. The Digitsole SmartShoe is not self-lacing; it does, however, have a cool way of securing itself to a wearer’s feet. The makers call it “auto-tightening,” and the Kickstarter page explains that there’s an engine in the back of the shoe that secures it around the foot. It kicks in once the smart shoes are on, and a mechanism that looks similar to a butterfly door brings the tongue pad down tightly over it. 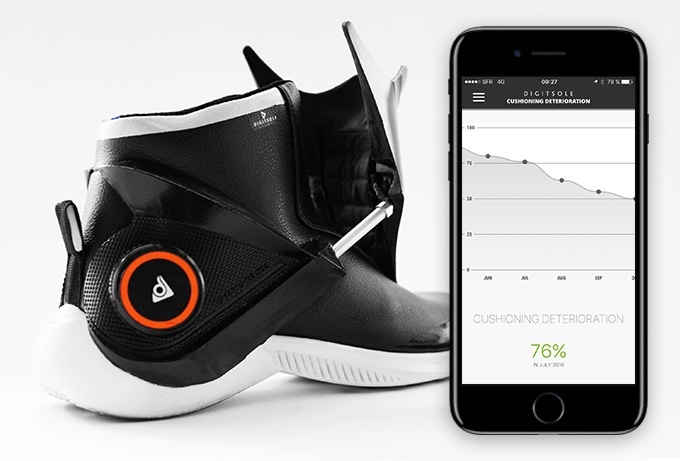 The auto-tightening can be controlled either using the accompanying mobile app or by pressing a button on the shoe. The shoes also pack a heating pad, because why not. It uses energy from the battery connected to a heating element to warm up the insole. Included within is a thermostat so you can set a desired temperature via the app, and the heat is turned off automatically once it reaches the temperature you want. Using the heating feature reduces battery life from about two weeks to a few hours, so that’s something users need to keep in mind. Everything else the Digitsole SmartShoe does is categorized as either a smart feature or activity feature. One of the smart features is a walking analyzer that collects data from sensors in the shoe to understand a wearer’s posture and stride. The results are then displayed to users on the mobile app. Digitsole also doubles up as a walking coach, giving recommendations on how to improve walking efficiency and prevent injuries. Activity sensors in the shoes are used to keep track of data such as distance covered, calories burned, and speed. To prevent injuries that result from deteriorated cushioning, the Digitsole SmartShoe comes with a cushion monitor. It displays the percentage of deterioration over time and even recommends new inserts. The shoes have raised $76,000 on Kickstarter so far, after setting a goal of $50,000. The campaign comes to a close on July 5. The $199 pledges have run out, so now you’re going to have to pony up $229 for a pair of SmartShoes. That’s still a whole 60 percent off the expected retail price of $599. Deliveries are projected to kick off December 2017. I wonder if anyone has been robbed before of these types of shoes? I like shoes. But I have always felt that shoes like these are just not that comfortable. Speaking of that, I think I am going to check out YouTube for some reviews, maybe. I am all over my shoes having cushion monitors, that is for sure! Dirt cheap price for the early birds that is for sure. There will not be that many sold, so getting a slice of history might be worth it in that respect. Pretty cool looking shoes with all of the technology going into them. I wonder about the heating pad. Why would you want your shoes to be hot? Also, if using the heating pad brings that battery life down that far, I wouldn’t use the feature in the first place. Smh. Why? Companies are just looking for a quick product they can sell quickly and for huge profits. These types of products are not sustainable. That is pretty much exactly what I was thinking. These fly by night products come around and people spend a lot of money on them.